The way we’re taught to live has got to change, says author Casey Gerald. Too often, we hide parts of ourselves in order to fit in, win praise, be accepted. But at what cost? 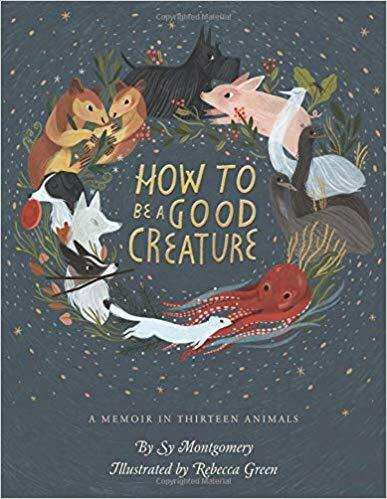 In this inspiring talk, Gerald shares the personal sacrifices he made to attain success in the upper echelons of American society — and shows why it’s time for us to have the courage to live in the raw, strange magic of ourselves. We see the familiar symbol everywhere — in text messages, signs, cakes, clothing, and more. But we also know the real heart looks nothing like it. Historian Marilyn Yalom tells us how the anatomical organ became the symbol that we all know today. Several years ago, I was meeting with a client I hadn’t seen in a few years. We started with the usual Hi. How are You? I’m Fine. How are You? small talk protocol, but then she saw a reliquary hanging on the wall in my office. 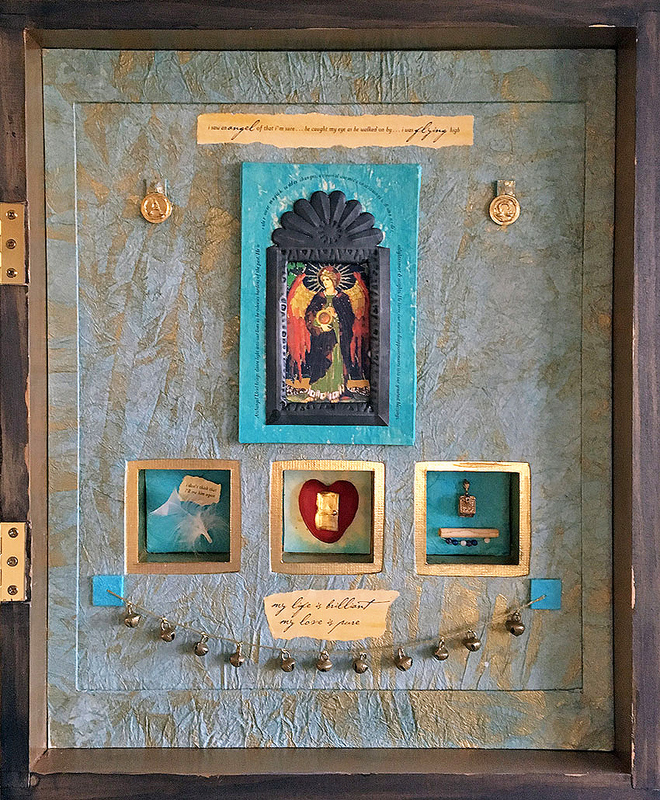 The reliquary — traditionally a container for holy objects — was a mixed-media collage I had created. Within the shadowbox frame was a painting of an angel, decorated panels, pieces of a poem, and symbols: an alpha and omega, a feather, a heart. An artist herself, my client asked about the piece, and I told her the story of lost love and deep sadness that had inspired it. When I was done, she took my hand and thanked me. Then she told me her story — the disappointment that had shaken everything she thought she knew, her attempts to heal, and how the process changed her. So there we were, two almost-strangers, pushing through the ordinary to the extra-ordinary moments in our lives. There was no protocol for the rest of our meeting that day, instead we talked about our common experiences, the different paths, the shared emotions. Ultimately, isn’t that our charge as artists? As writers? To communicate the human experience — to bravely tell our own stories in an effort to share, to teach, to connect with others. Make no mistake — it takes courage. It takes courage to be honest, to talk about love and loss, about success and disappointment. You have to be brave to talk about your passions and fears — both out loud and in your creative work. Writing, creating art, is not for the faint of heart. No. Writing, creating any kind of art that tells our story, takes big, brave hearts. It is from that place, from that wide open courageous place, that we create what is indeed, holy. Branford entrepreneurs Gina Macdonald and Jen Payne speak on their individual passions for their work, and how their creative interests in writing, art and mindfulness led to a collaborative effort on Gina’s new book Mind Your Own Body: A Body Image Handbook. 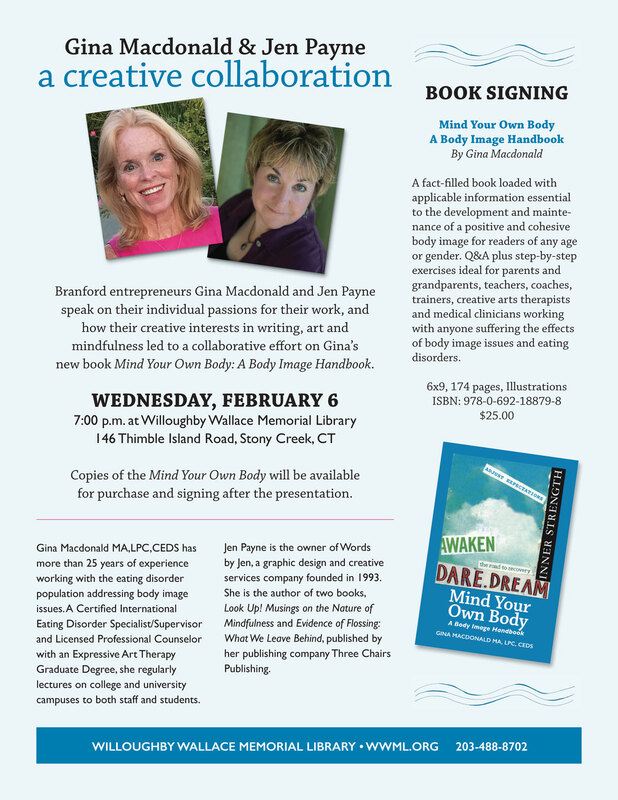 Copies of the Mind Your Own Body will be available for purchase and signing after the presentation. Gina Macdonald MA,LPC,CEDS has more than 25 years of experience working with the eating disorder population addressing body image issues. A Certified International Eating Disorder Specialist/Supervisor and Licensed Professional Counselor with an Expressive Art Therapy Graduate Degree, she regularly lectures on college and university campuses to both staff and students. Jen Payne is the owner of Words by Jen, a graphic design and creative services company founded in 1993. She is the author of two books, Look Up! 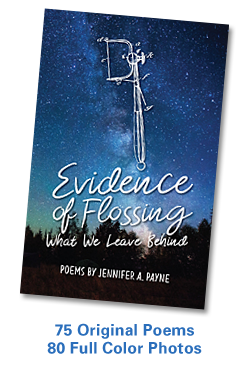 Musings on the Nature of Mindfulness and Evidence of Flossing: What We Leave Behind, published by her publishing company Three Chairs Publishing.